Ursula was appointed Principal Bassoon of the AAM in July 2011, the latest development in a career which has featured acclaimed performances on both modern and period instruments as a soloist, chamber musician and orchestral member. 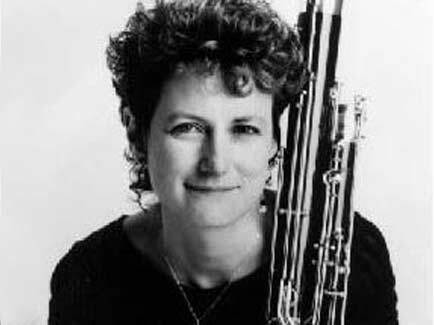 As well as her role with the AAM, Ursula is currently the bassoonist of London’s Nash Ensemble, the resident Ensemble at the Wigmore Hall, and was Principal Bassoon with the Scottish Chamber Orchestra from 1987 to 2007. She is frequently invited to appear as guest principal with major orchestras and ensembles throughout Britain and Europe. In May 2011 Ursula performed Vivaldi’s Bassoon Concerto in D minor with the AAM on a tour of the Far East. Elsewhere, her solo work has included concertos with the Scottish Chamber Orchestra, London Symphony Orchestra, Royal Liverpool Philharmonic Orchestra, BBC Scottish Symphony Orchestra and at the Barbican’s Mostly Mozart Festival with the Academy of St Martin-in-the-Fields. She has also championed the little-known concerto by the Bohemian composer JBG Neruda. Sir Peter Maxwell Davies’ Bassoon Concerto was written especially for Ursula, and her recording of the work was released in 1994. Other recordings include the Mozart Bassoon Concerto with the Scottish Chamber Orchestra, the complete chamber music of Poulenc and Saint-Saens, and the Beethoven Septet and Schubert Octet with the Nash Ensemble. She also features on a disc of the complete Chabrier songs with Dame Felicity Lott and Graham Johnson. As an orchestral player she has recorded numerous Mozart Symphonies and Operas with Sir Charles Mackerras and several Mozart Piano Concertos with Alfred Brendel. When not travelling and performing, Ursula lives in the Lake District with her husband and four-year-old daughter. You can find out more about Ursula here.